Seventy-four of the Palestinians were killed during incidents in which they allegedly assaulted or attempted to assault Israeli security forces and civilians. 17 were killed during clashes with Israeli forces, equipped with lethal arms, in demonstrations and in stone-throwing incidents. In its Weekly Report On Israeli Human Rights Violations in the Occupied Palestinian Territories for the week of 13 – 19 April 2017, the Palestinian Center for Human Rights (PCHR) found that Israeli forces continued systematic crimes in the occupied Palestinian territories. Over the past week, Israeli forces killed a Palestinian civilian in southern Bethlehem in employment of deadly force. 7 Palestinian civilians, including 3 children, were wounded. During the reporting period, Israeli forces killed a Palestinian man and wounded 7 others, including 3 children, in the West Bank. In the West Bank, on 19 April 2017, in employment of deadly force, Israeli forces killed Sohaib Mashahra (21), from al-Shaikh Sa’d village, southeast of occupied Jerusalem. The aforementioned person was killed when Israeli forces stationed at “Kufr Ezion” settlement, south of Bethlehem, opened fire at a car he was driving after the car hit an Israeli bus. Israeli forces claimed it was a deliberate attack targeting settlers, but photos of the scene shows it was likely a normal car accident. According to preliminary information about the crime, at approximately 16:00 on the same day, Suheib Mousa Mashhour Mashahrah (21) was returning from Hebron to his house in al-Sheikh Sa’ad village, southeast of East Jerusalem. When he turned around the intersection of the abovementioned settlement, his car hit an Israeli bus from the back as a group of settlers were waiting at the bus station. The Israeli soldiers, who were in the area, opened fire at the windshield and side glass of the car. As a result, the abovementioned civilian sustained several live bullets wounds throughout his body. He was then transferred by an Israeli ambulance to “Shaare Zedek” Medical Center in West Jerusalem, but he died upon arrival. The Israeli media said that a 60year-old Israeli civilian was wounded after he a Palestinian young man ran over him. He was transferred to “Shaare Zedek” Medical Center to receive medical treatment as his injury was classified as minor. The Israeli media also said that the soldiers opened fire at the car driver to neutralize him. However, the photos published showed that the car hit the bus from the back, but the car was badly damaged from the front, indicating that it was a normal accident and the driver had no intention to carry out a run-over attack. During the reporting period, Israeli forces wounded 7 Palestinian civilians, including 3 children, using force against peaceful protests. On 14 April 2017, 2 children were wounded when Israeli forces opened fire at Kufor Qaddoum weekly protest, northeast of Qalqilya. On the same day, 4 civilians were wounded to the lower limbs when Israeli forces erected a checkpoint at the intersection of Tamoun village, south of Tubas, and opened fire at the youngsters who gathered and throw stones at the Israeli soldiers. At approximately 17:30, Israeli forces established a checkpoint at the crossroad of Tammun village branching to the east of Tubas – Nablus Street, south of Tubas. A number of young men gathered and threw stones at the Israeli soldiers. The Israeli forces fired live bullets, rubber-coated metal bullets and tear gas canisters at the young men in response. As a result, 4 civilians sustained live bullets to the lower limbs of their bodies and were taken to Tubas Hospital to receive medical treatment. Their injuries were classified as moderate (PCHR keeps the names of the wounded civilians). On 15 April 2017, a Palestinian child sustained a bullet wound to the head when Israeli forces opened fire at Kufor Qaddoum weekly protest, northeast of Qalqilya. Concerning house demolitions, on 18 April 2017, the Israeli municipality vehicles demolished 2 mobile houses in Khellet Abed neighbourhood in al-Mukaber Mount village, southeast of the city. One of them belongs to the family of Ammar Salama Hadidon sheltering 7-member family and the other belongs to the family of Mohammed Amin Shqairat. On Monday, 17 April 2017, at approximately 01:00, Israeli forces moved into Hebron and deployed in several neighbourhoods in the city. They raided and searched Mohammed Cultural Library in al-Jame’ah neighbourhood belonging to Mohammed Abdul Shaker Mohammed Tarshan from Tarqumiya village, west of the city. They opened the main door with special tools. After half an hour, the soldiers welded the library doors with oxygen and fixed a military decision to close it until 22 April 2017. They also left threat notices to shops’ owners that “support terrorism” in addition to a list of the confiscated items that included hard desks and USBs. However, the library’s owner denied being affiliated with any Palestinian faction and that he neither received a call or summons by the Israeli Intelligence Service. In the Gaza Strip, concerning Israeli attacks on fishermen in the Gaza Strip sea, on 13 April 2017, Israeli navy forces opened fire at the Palestinian fishing boats sailing within 4 nautical miles, west of al-Sudaniya shore, north of the Gaza Strip. On the same day, Israeli gunboats opened fire at the Palestinian fishing boats sailing within 1.5 nautical miles northwest of Beit Lahia shore, north of the Gaza Strip. A similar attack recurred off al-Sudaniya shore on 14 April 2017 while 2 others recurred off Beit Lahia shore on 15 and 19 April 2017. In the context of targeting the border areas, on 13 April 2017, Israeli forces stationed at the border fence, north of al-Sayafa area, northwest of the Gaza Strip, opened fire at agricultural lands adjacent to the border fence between the Gaza Strip and Israel. On 18 April 2017, Israeli forces stationed at the border fence, east of Beit Hanoun village, north of the Gaza Strip, opened fire at the border area, however, neither casualties nor material damage were reported. At approximately 10:00 on Wednesday, 19 April 2017, Israeli forces accompanied with a vehicle of Israeli Civil Administration moved into Sha’b al-Sair area, south of Beit Ummer village, north of Hebron. They then stationed in a stone quarry belonging to YouseF Abed al-Hamdi Abu ‘Aiyash (50) and handed him 2 summonses to stop working in the quarry, which he built 18 years ago. The Israeli forces also confiscated a digger and bulldozer belonging to Mohamed Hasan al-Barbarawi. On Thursday, 13 April 2016, dozens of Israeli settlers raided al-Aqsa Mosque’s yards in occupied Jerusalem’s Old City. It should be noted that they raided the mosque’s yards in order to celebrate the Jewish Passover under the Israeli forces’ protection. Firas al-Dibs, the Spokesperson of Public Relations Officer at the Islamic Endowments (Awqaf) Department, said that in the morning around 252 Israeli settlers raided al-Aqsa Mosque via al-Magharebah Gate while in the afternoon 77 Israeli settlers raided the mosque under the Israeli forces’ protection. The settlers tried to perform their religious rituals during their tours in the yards; some of those settlers lied on the ground, and then the Palestinian guards took him out of the area. After the Israeli settlers ended their tours and left the mosque, they headed towards al-Silsilah Gate, where they danced, sang and hang posters written on it, “Ascending to the Temple Mount.” Moreover, the settlers performed their religious rites at al-Silsilah and al-Katanin Gates, where they received explanations about the “alleged temple.” Thousands of settlers also performed another prayer called” Temple priestly blessing” in al- Buraq yard, coinciding with the third day of the Passover. The Israeli forces closed several streets and roads in Jerusalem, especially which lead to al-Buraq yard. They also deployed in the city’s streets and at al-Aqsa Mosque’s gates. The Israeli soldiers obstructed the arrival of worshipers to the mosque. At approximately 17:30 on Saturday, 15 April 2017, a group of Israeli settlers from the “Arosa” settlement, south of Nablus, raided civilian houses in the outskirts of Burin village. The Israeli settlers threw stones at Palestinian houses under the Israeli forces’ protection. A number of Palestinian young men gathered in an attempt to expel the settlers from the village and threw stones at them. In the meantime, the Israeli soldiers fired sound bombs and tear gas canisters at the village residents. As a result, fire broke out in the settlement, and the civil defence crews managed to control the fire before the settlement was engulfed in flames. Israeli troops engaged in excessive force against peaceful demonstrations protesting settlement activities and the construction of the annexation wall. At approximately 12:40 on Friday, 14 April 2017, Palestinian civilians and International activists organized a demonstration in the center of Kufur Qaddoum village, northeast of Qalqiliyah. They made their way towards the eastern entrance to the village in protest against closing that entrance since al-Aqsa Intifada with an iron gate. When the protestors arrived at the abovementioned entrance, the Israeli forces heavily fired metal bullets, sound bombs and tear gas canisters at them. 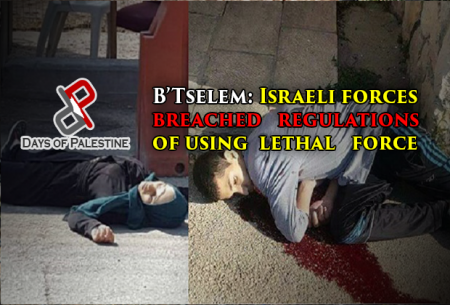 As a result, Husam Khaldun Abed Abu Khaled (12) sustained a metal bullet wound to the back, and Ezz Eden Abdul Qader Eshtaiwi (12) sustained a metal bullet wound to the ear. Following the Friday prayer, dozens of Palestinian civilians and Israeli and international human rights defenders organized demonstrations in Bil’in and Nil’in villages, west of Ramallah, and in Nabi Saleh village, northwest of the city, protesting against the annexation wall and settlement activities. Israeli forces forcibly dispersed the protestors, fired live and metal bullets, tear gas canisters and sound bombs. They also chased the protesters into olive fields and between houses. As a result, many of the protesters suffered tear gas inhalation while others sustained bruises due to being beaten up by the Israeli soldiers. At approximately 17:30 on Saturday, 15 April 2017, Palestinian civilians and International activists organized a demonstration in the center of Kufur Qaddoum village, northeast of Qalqiliyah. They made their way towards the eastern entrance to the village in protest against closing that entrance since al-Aqsa Intifada with an iron gate. When the protestors arrived at the abovementioned entrance, the Israeli forces heavily fired metal bullets, sound bombs and tear gas canisters at them. As a result, a 17-year-old civilian sustained a metal bullet wound to the head. On Monday afternoon, 17 April 2016, hundreds of Palestinians organized a demonstration in solidarity with prisoners in the Israeli jails coinciding with the Palestinian Prisoner Day and prisoners starting hunger strike. The demonstration was organized by the factions and organizations in Bethlehem along with school and University students. The protestors made their way towards the northern entrance to Bethlehem as they raised flags and slogans supporting the prisoners in their hunger strike and calling upon the international community to support prisoners in their fair demands. When the protestors arrived at Checkpoint (300), north of the city, the soldiers fired tear gas canisters, sound bombs and rubber-coated metal bullets at them. As a result, many civilians sustained tear gas inhalation and fainted. They received medical treatment on the spot. At approximately 14:30 on the same Monday, a number of young men organized a peaceful protest in solidarity with Palestinian prisoners, who went on a hunger strike, near the entrance of “Ofer” military camp established on Betounia and Rafat villages, west of Ramallah. The protestors threw stones and empty bottles at the Israeli soldiers, who fired sound bombs, tear gas canisters and rubber-coated metal bullets in response and chased them. They abducted 4 children namely Ahmed Ibrahim Turki (15), Mohammed Yahiya al-Sarafandi (17), Hassan Mohammed Zaid (14) and Osama ‘Orabi Nakhlah (15). PCHR also called upon the international community, especially states that import Israeli weapons and military services, to meet their moral and legal responsibility not to allow Israel to use the offensive in Gaza to test new weapons and not accept training services based on the field experience in Gaza in order to avoid turning Palestinian civilians in Gaza into testing objects for Israeli weapons and military tactics.